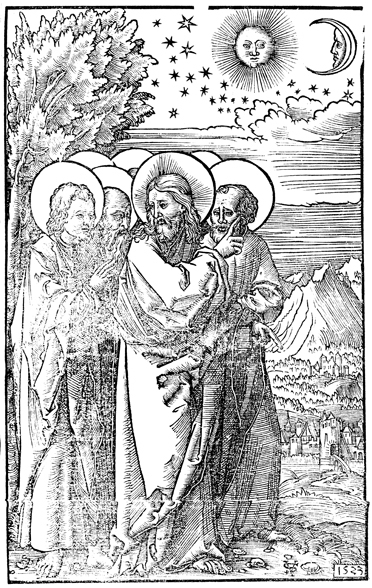 Book Title: Avszlegung der Epistelen vnd Euangelie[n], : die nach brauch der Kirchen gelesen werden, durch den Advent, vnd dannenthin vom Christag biss auf den Sontag nach Epiphanie. Darin reichlich anzeygt vnd fürgebildet würt, was eim [sic] Christen menschen zuo / D. Martinus Luther. Description: Jesus teaches his disciples about the approaching end of the age. The artist, Virgil Solis (1514-1562), has placed his monogram "VS" in the lower right corner of the woodcut. Click here for additional images available from this book. This image is made available by the generous contribution of the joint ATS/ATLA Cooperative Digital Resources Initiative and the Luce Foundation.